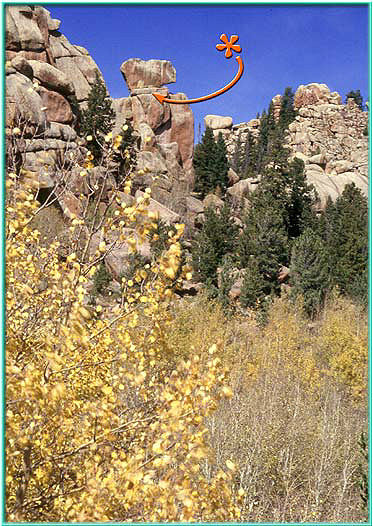 THIS SITE IS PRIMARILY INVOLVED WITH ROCK CLIMBING AT VEDAUWOO, “LAND OF THE EARTHBORN SPIRIT“. At an altitude of 8,000 feet, Vedauwoo is a rather secluded rocky oasis in southeastern Wyoming, filled with dense pine forests and aspen groves. It is surrounded by a seemingly endless expanse of high plains and lies under a dome of intense cerulean blue sky. Views from the tops of the crags are stunning, and one can see from Wyoming’s ragged mountains clear down the Continental Divide to Long’s Peak, some 75 miles south in Colorado. A multitude of free-ranging animal species are commonly found here, including small mammals, antelope, moose, deer, cattle, climbers and an occasional black bear or cougar. Today, climbers and others come here from nearly everywhere to indulge themselves within a setting of alien rock formations and scenic valleys found only at Vedauwoo. See the MAP of Greater Vedauwoo for a quick orientation to the entire area. This is ‘high country’ and wind is ever present, whether just a light breeze prowling through the aspen groves or near hurricane force gales. Storms of near bestial proportions are spawned in the SNOWY RANGE about 50 miles to the west and many times descend upon the valleys of Vedauwoo. Should you decide to visit, you might want to check the weather prior to coming, especially in the spring or late fall. There is a live cam at the Vedauwoo Exit as well as atmospheric sensors near Vedauwoo. There is another live cam south of Cheyenne (if you’re coming up from the Front Range). In fact, no matter what the conditions or season, come prepared for CHANGE (*check this out!!) – it can occur in an instant! So whatever you decide to do here, from aggressive sports like climbing, bouldering, biking or trail running, to more quiescent activities like attending the Vertical Dance Performance or hiking around the back country engaging the flora and fauna, the promise is one of a unique and unforgettable experience. There are more photos in the PHOTOGALLERY. Opening dates, road closures, etc. are found on the News page and on the U.S. Forest Service website. 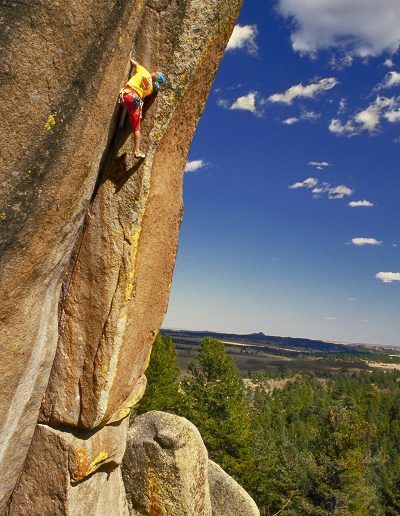 . . .THERE IS AWESOME CLIMBING HERE ! . .
WHERE: Vedauwoo is located in southeastern Wyoming along Interstate I-80, about 30 miles west of Cheyenne and/or about 20 miles east of Laramie at Exit # 329. WHEN: The climbing season stretches from about Mid-April thru Mid-October. Some push it past these times, but ‘windows of opportunity’ become much less frequent outside these limits. You might want to check out the News page for Gate Opening Dates, Pass Prices, etc. YOU can check out GOOGLE MAPS for a cool satellite view of Greater Vedauwoo…..
Click on it to make it larger. SOMETHING TO REMEMBER…. A ‘COWBOY SPIRIT’ PERVADES THIS PLACE. THIS LAND BREEDS ADVENTUROUS PEOPLE WHO SOMETIMES IGNORE POTENTIAL RISKS …. ‘BRUSHPOPPERS’. 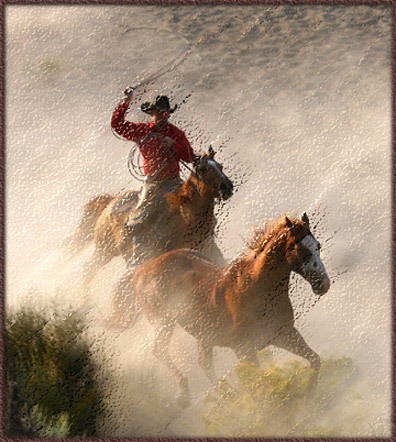 MANY ARE SLIGHTLY UNSTABLE, BUT READY FOR ANY CHALLENGE – WITH A RECKLESS PERSEVERANCE TO “HANG ON IN THE FACE OF ADVERSITY OR GET BUCKED OFF”.THIS IS BUT ONE OF MANY ELEMENTS THAT MAKE THIS PLACE SO UNIQUE. 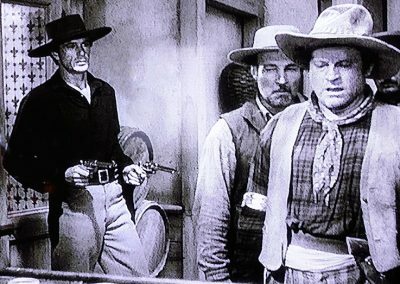 SO DIG IN YOUR SPURS AND GET READY FOR A RIDE!! 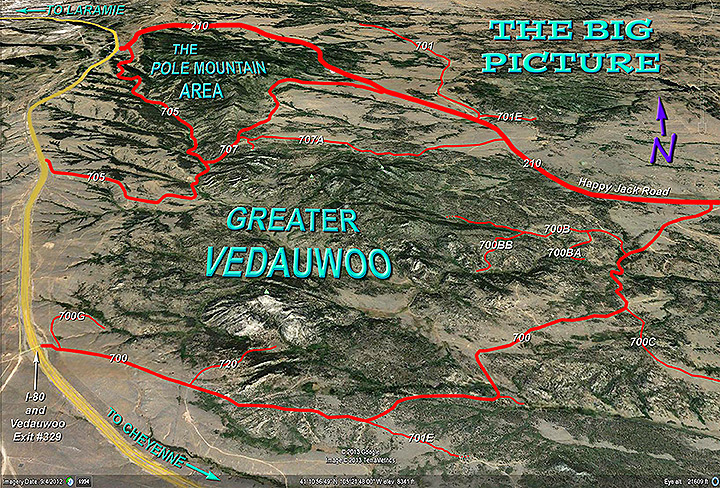 The first map (the big picture) illustrates the entire Vedauwoo area as well as the Pole Mountain Area to the immediate north. The second map (….) shows Greater Vedauwoo in more detail. While Vedauwoo is the obvious focus here, both areas are intimately interlocked by a system of USFS roads (shown) and trails (Described in the hiking/biking section). Both areas are bounded on the west by I-80, on the north and east by Happy Jack Road and essentially divided by USFS Road #705-707. Greater Vedauwoo extends southward from here to USFS Road #700 for the most part. 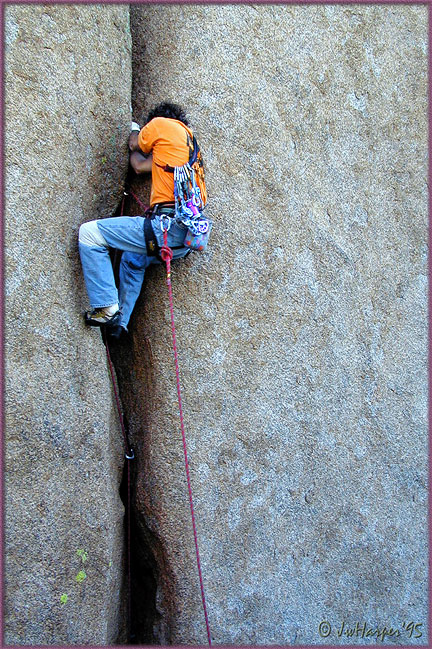 Rock climbers come to Vedauwoo from all parts of the world to sample some of the best wide crack climbing (called “OFFWIDTHS’) known. There were over 500 challenging and sometimes bloodthirsty traditional and sport climbs documented in the book entitled Heel and Toe, The Climbs of Greater Vedauwoo, by myself (Skip Harper) and Rob Kelman. Published in 1994, this guidebook was the first of its kind to employ computerized graphics at high resolution (Photoshop didn’t exist!) and emphasized the illustration of real routes on real rock. Unfortunately, it is no longer available. Of course climbing at Vedauwoo has expanded considerably since Heel and Toe. Now there are over 1,000 climbs and new areas have evolved. Hopefully this website provides much broader coverage including most of this new development. If its not here now, it will be soon. ** NOTE: Three Guidebooks currently provide coverage of the Vedauwoo Area. These are detailed in the BOOKS section of this website. 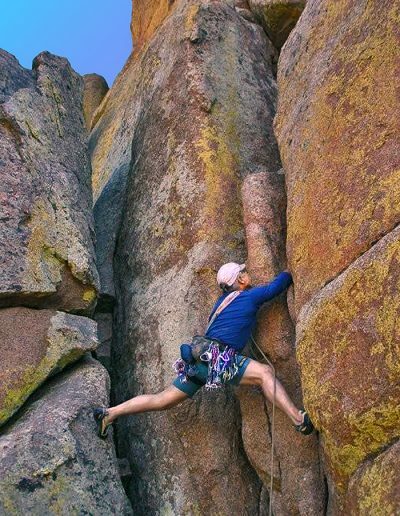 Scott Miller taking on the challenging ‘Moonrise Variation’ (10d) in the Land of the Rising Moon. A painful howl echoed through the woods “this thing is eating me alive”! I had to chuckle as I recalled my first experience climbing at Vedauwoo. The precambrian granite is laced with huge feldspar crystals with scalpel like edges that can impart much more than just friction to a climbers body parts. It has been stated that this attribute tends to “filter out the weak, the soft and the spineless, which leaves better company for you”(Todd Skinner). Also be forewarned, the climbs are notoriously difficult. 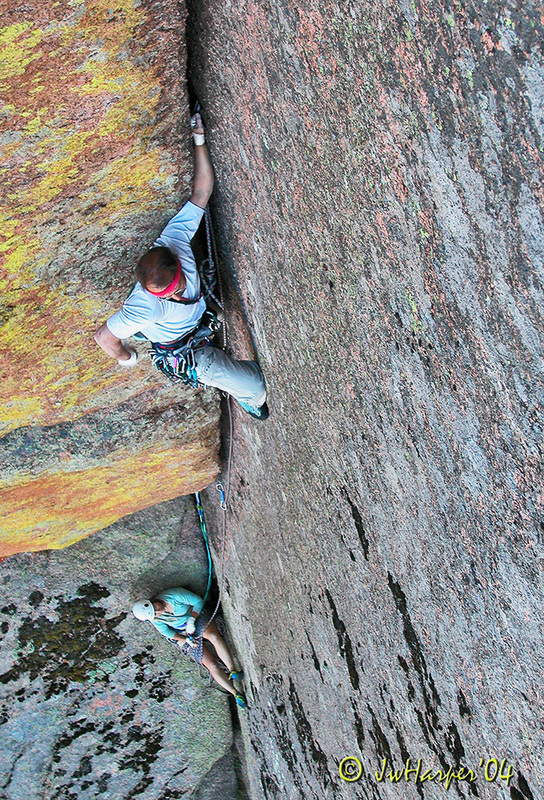 Solid 5.11 leaders have been sandbagged by many routes of lesser grade. Whatever the case, its a good idea to ‘tape up’ when climbing here and, for those who can get past these things, absolutely world class climbing experiences can be found. 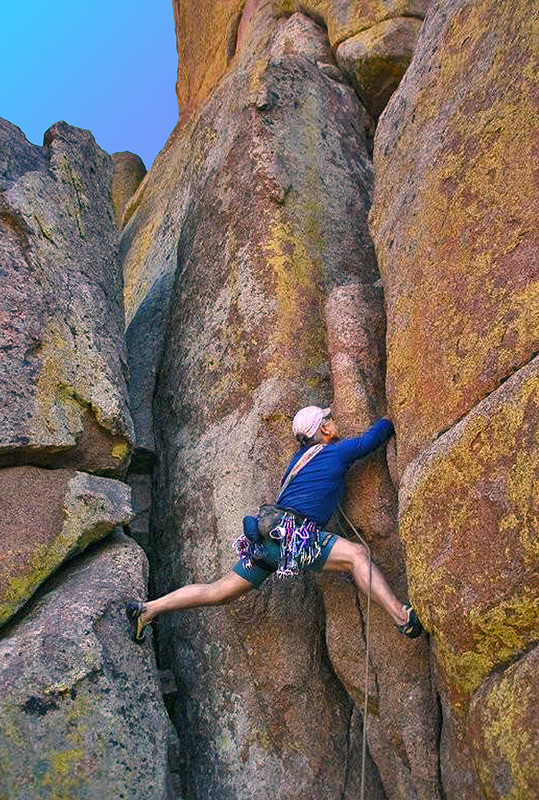 Perhaps offwidths (cracks wider than your fist, yet narrower than your body width), more than any other type of climb have formed the basis of Vedauwoo’s widespread reputation. Many a seasoned crack climber has looked up into the gaping jaws of one of these gut wrenching monsters and just walked away. But if wide cracks are your fare, this is the place! TAKE A LOOK AT THE VIDEO TO THE RIGHT TO FIND OUT WHAT CLIMBING AN OFFWIDTH IS ALL ABOUT, AS WELL AS AN INTERESTING TOUR AROUND VEDAUWOO!! (Big thanks to Pamela Pack and her ‘team’ for this vid! She is one incredible offwidthing phenom!) 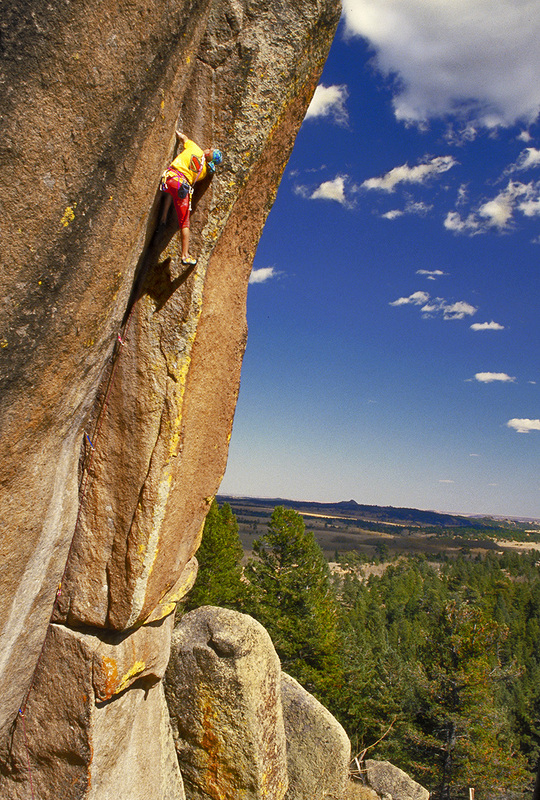 Next, check out Luebben ‘handstacking’ up Bell Crack (11b) just below. Other examples of OFFWIDTHS are Horn’s Mother (11a) on the Coke Bottle (a long, two pitch body-rending grind) and Trip Master Monkey (12b) in the Master Blaster Area. On a much more moderate note is Hideaway Chimney, a choice 5.5inside double dihedral found on the Holy Saturday Formation. So anyone can enjoy offwidthing (is this possible??) if you know where to look. Hand and finger cracks abound in the area, many of which are considered superior lines. Friday the 13th on the Nautilus is one such climb, an exquisite, 3 pitch long line of the purest hand jamming found anywhere. 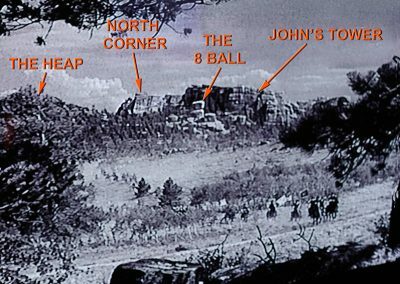 The first pitch is about 60 feet of superb 9+ hands, the second pitch (roof) goes about 10b and the third pitch (roof), at 11d or so, requires a true cowboy attitude or you’ll get bucked right off!! That’s where Steve Bechtel is in the bottom photo on the home page, the third pitch! Or try the super thin fingers of Blade Runner (11b) seen in the shot to the right. On a lighter note, try Strawberry Jam on the Crystal Freeway for the best handcrack at 5.8 in all of Vedauwoo. 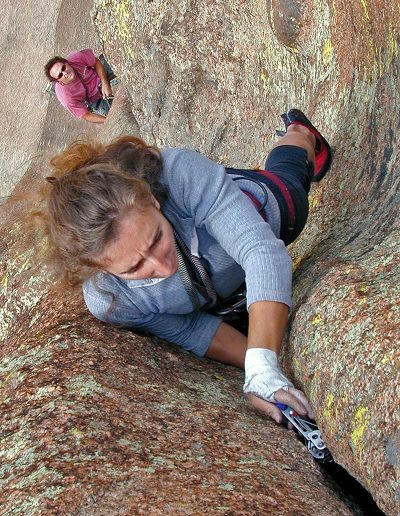 *NOTE: If you really want to see what climbing finger cracks is all about, watch the VIDEO to the left. Mason Earle shows us how it’s done in style. This vid documents the SECOND ASCENT of ‘Yasha Hai’ (5.13b) in Chinatown, a route put up in 1989 and remained unrepeated until now. 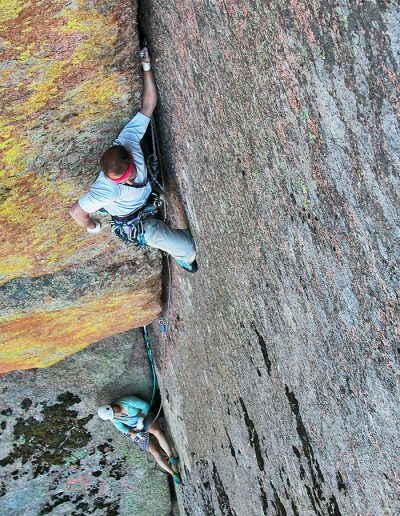 He also grabs the THIRD ASCENT of ‘Home on the Range’ (5.13d). Way to go Mason!! You are now a part of Vedauwoo history. 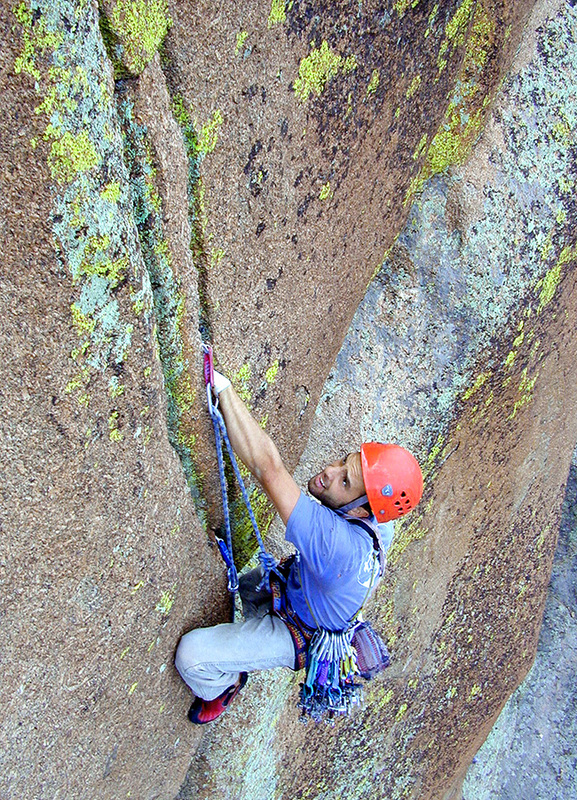 A variety of face climbs have been created by the artistic skill of local climbers who have visualized lines into otherwise unattainable vertical terrain. “Fall Wall” (10a) on the Fall Wall formation is a moderate bolted face climb whereas Space Oddity (12a) is found on the Coke Bottle and offers a superb challenge of delicate, dance-like moves up a 120′ crystalline face. North Shore (13a/b) on Holdout will challenge the best of sports or try the more recreational 2nd Iteration (10c) in Jurassic Park. The shot is of Jim Ghiselli on Braggin’ About Jesus (10a) in Blair. 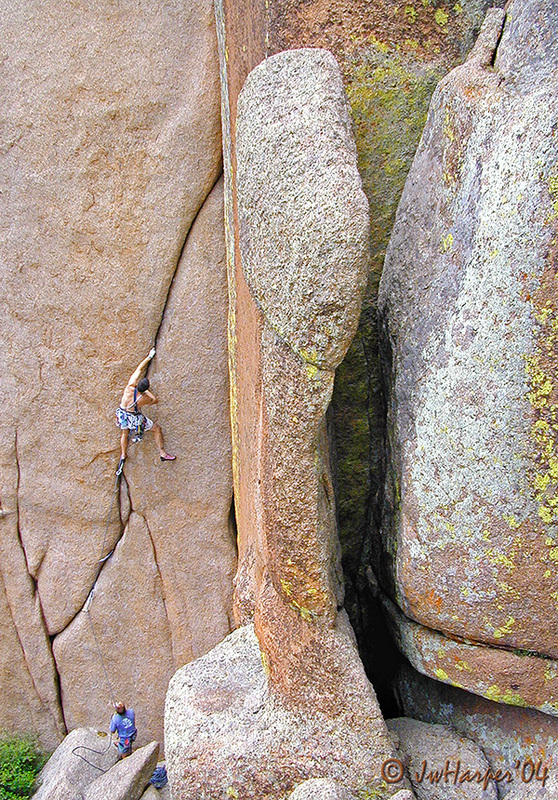 Mixed climbs sharing more than one climbing style (ie off width plus considerable hand and/or finger jamming; or hands plus bolted face, etc.) 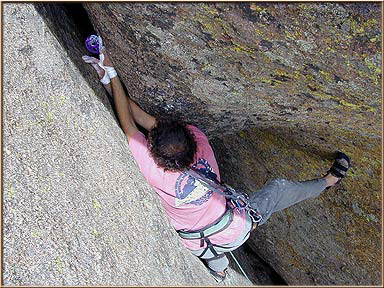 are also found throughout the area and offer a special challenge to those proficient at only one or two climbing forms. The one shown below is Master of Sport (12b), starting with strenuous fingers and ending with handjamming. Stinkzig (5.7) on the Nautilus is another climb in the more moderate grades, and Boardwalk (11b) on the Coke Bottle is one of the harder ones. 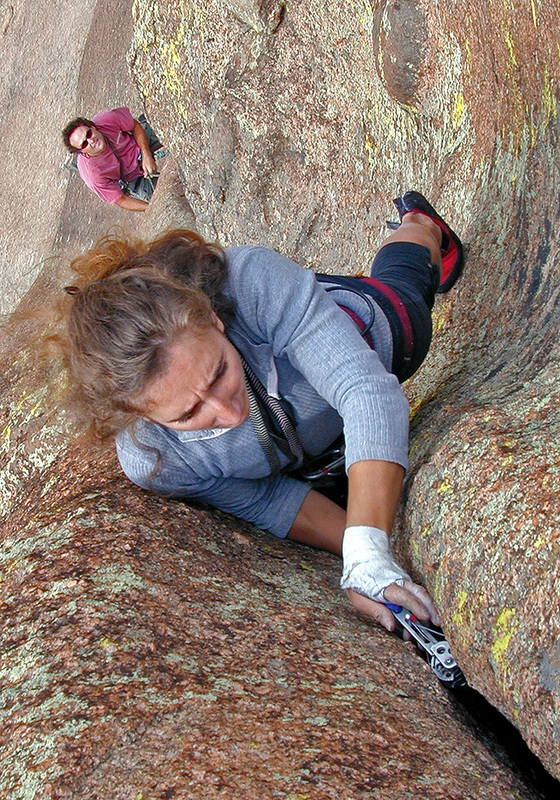 Also see Turnaround (10b/c) on Blair 2 in the New Climbs Section. While it is believed that man was present in the southeastern quadrant of Wyoming for 15 to 20,000 years, fluted Clovis points (arrowheads) have been found in the general area of Laramie, indicating continuous, albeit scanty habitation about 11,000 years ago. The presence of man in the region now known as the Medicine Bow-Routt National Forest (including the Snowy Range, Sherman Mountains, and Vedauwoo) stretches back about 8,000 years, based upon a few small archeological sites with unique stone knives and lanceolate points called “Cody Complexes”. These people were nomadic hunters, very dependent upon wandering large mammals for their existence. As the weather trended towards more temperate conditions about 5,000 years ago, the plains and intermountain regions became more highly populated. This seems to coincide with an upswing in short grass production on the high plains and consequently, influx of massive buffalo herds. Following widespread tribal migrations during the 1700’s, the major Indian tribes using the general area were the Arapaho, Cheyenne, Sioux, Shoshone and Ute. Territorial claims by these various tribes were often exaggerated, overlapping and never secured by sustained use or warfare. Certainly, up through the late 1800’s, the Medicine Bow region was well known for hunting, raiding and trading and it was generally thought of as Arapaho and Cheyenne territory. There is local belief that the ‘Vedauwoo Rocks’ were held as a sacred area by these Indians who thought that the ‘sacred’ was not abstract and distant, but alive in every facet of nature. The ‘sacred’ could manifest itself through natural forces like thunder, wind, sun and moon, as well as through natural beings like the bear, antelope, and eagle. Vedauwoo may have been a site of “vision quests”, spiritualistic rituals of coming manhood, by young braves of these tribes. Despite rudimentary evidence indicating Spaniards may have been in the area earlier, French maps indicate trapping activities were occurring during the mid 1700’s. Euro-Americans began encroaching more heavily into the area in the early 1800’s, primarily exploring for western passage through the mountains, and for exploiting natural resources. 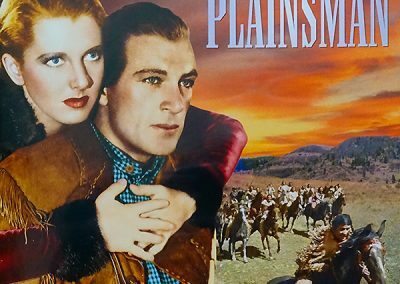 In 1843, Fremont (the pathfinder), proceeded up the South Platte to the eastern base of the Front Range in Colorado, turning north to Fort Laramie. This route, known as the Overland Trail, was heavily used from about 1860 to 1880. It followed modern Colorado Highway 287 straight north from LaPorte, Colorado to Laramie, bypassing Vedauwoo to the west. While principal trade and migratory routes (like the Overland Trail) skirted Vedauwoo, the railroad did not. The Union Pacific Railroad was the chief catalyst in opening the Medicine Bow region to exploration and settlement in the mid to late 1860’s. Fort Buford, Sherman, Laramie City and other small settlements sprang up as the line advanced westward. 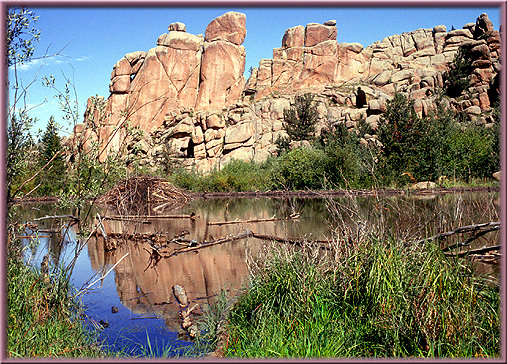 Vedauwoo, then known by some as “Skull Rocks”, was completely denuded of forestation by tiehacks, later to be reforested by the Civilian Conservation Corps in the 1930’s. 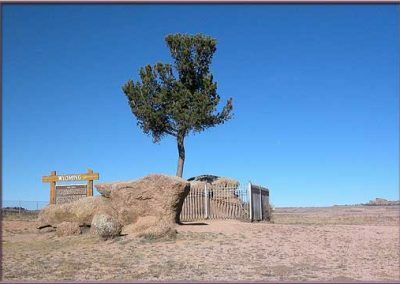 The Ames Monument, which can be seen on the plains to the south from Vedauwoo, was built to commemorate the highest point on the line. Despite indian attacks, bad weather, engineering problems, and logistical setbacks, the transcontinental railroad was completed in 1869. This section of the road was the worst, wheels dropped off, tires disintegrated, radiators boiled over and axels cracked. Strong arms had to drag vehicles out of deep mud and across unbridged rivers. On the steepest grades near ‘piles of strange rocks’ (Vedauwoo? 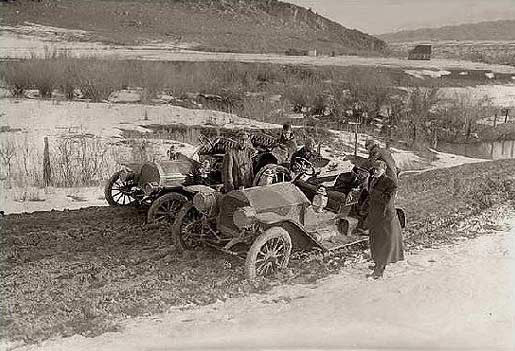 ), gas tanks were so much lower than the carburetors, the whole caravan had to turn around and back up to get where they were going. They camped right there, spent from physical exhaustion. Despite 34 days of adversity, the enterprise was successful and the country began opening up to a new breed of adventuresome individuals. Today there is a 48′ high tower topped with a bust of Lincoln at ‘The Summit’ of Sherman Hill (5 miles west of Vedauwoo) commemorating the “Lincoln Memorial Highway”. Much more on the local history of this subject can be found HERE at this great resource. Despite claims to the contrary, we DO KNOW where the name Vedauwoo comes from. It is an anglicized version of the Arapahoe word “biito’o’wu”. The word came about through the interaction of Maybelle Land DeKay, (a Professor of English and Drama at the University of Wyoming in Laramie) and the Arapaho Indians of the time – and it was used as the title of her play performed live at “Vedauwoo Glen” three times between 1924 and 1931. Ms. DeKay felt strongly the Indians had first discovered the true spirit of the landscape and decided to give her play an Indian name. She asked the Episcopal missionary John Roberts (an acquaintance who was living on the Wind River Reservation at the time) for an Indian word meaning ‘earth born’. Roberts and Ms. DeKay thusly derived the word Vedauwoo from biito’o’wu. 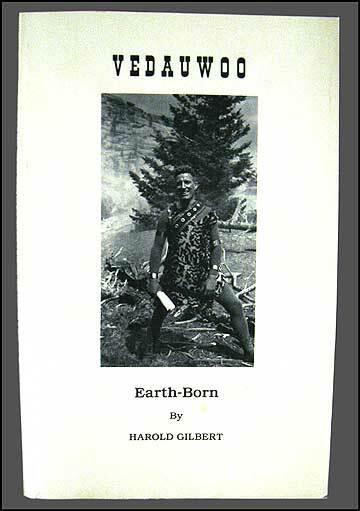 According to Richard Moss, an authority on the Arapaho language, “earth” is the denotative meaning of ‘biito o wu’, although it has the connotation of “earth born” because Arapaho cosmology dictates the earth is the source of all life. Incidentally, some refer to Vedauwoo as meaning “earth born spirit” – which is incorrect according to Moss. Grammatically, this phrase is very different in Arapaho: ‘beniito’wuu betee’ouw ceebii’oot’. Nonetheless, the ‘Land of the Earthborn Spirit’ has been associated with Vedauwoo ever since the 1920’s. More rather astonishing historical detail about Ms. Dekay’s production is found HERE. 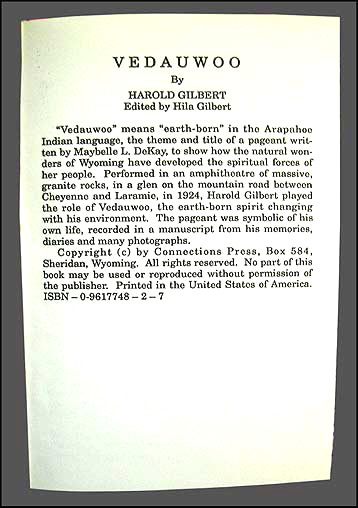 There are many hard references to the etymology of the word vedauwoo including past newspaper articles, playbills and books, 2 of which describe it in considerable detail (see for example Chapter 3, ‘The Story of Vedauwoo -1924’, in “History of Dramatics at the University of Wyoming”, M. L. DeKay, self-published, 1936 – now part of the Hebard Collection, American Heritage Center, University of Wyoming Archives). Take a look at another such book covering the subject in the MUSEUM. It is also notable that railroad maps of the area relinquished the name Skull Rocks in favor of Vedauwoo Glen thereafter and maps and records of the Civilian Conservation Corps recorded the area as Vedauwoo Glenn in the 1930’s. Wyoming” (also with Mathiesen) came out in 1971. It detailed 88 climbs in Vedauwoo and more in the surrounding areas. Even at that time, Halfpenny indicated great difficulty in obtaining first ascent information, a problem that fires up continuous controversy even today. [ The image above is Jim Halfpenny in the late ’60’s, the right photo is Jim ‘now’ (’02). ] 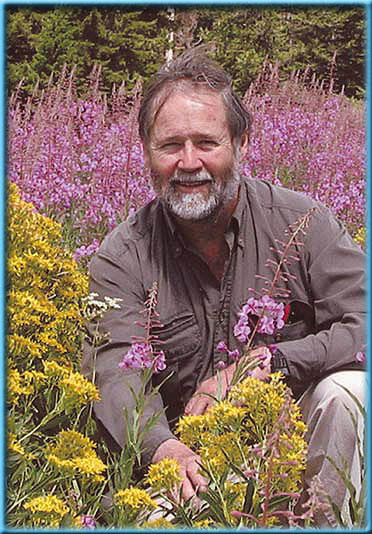 Today, Jim resides in Gardiner, Montana, a teacher, businessman and avid outdoorsman. Later, when the transition from aid climbing to free climbing was evolving, Layne Kopischka’s series of guide books (’82, ’87, ’92) provided invaluable, up to date climbing information, although unfortunately, first ascent information was left out. Kopishka (legendary ‘Coach’ and mentor of many young climbers) passed away in July of 1992 (an interesting short biography of Kopischka appeared in Outside Magazine, 12-’99). At the time of Kopischka’s last effort, there were approximately 220 climbs documented which were centered within Vedauwoo Glen, although considerable development had been taking place outside of the traditional area. 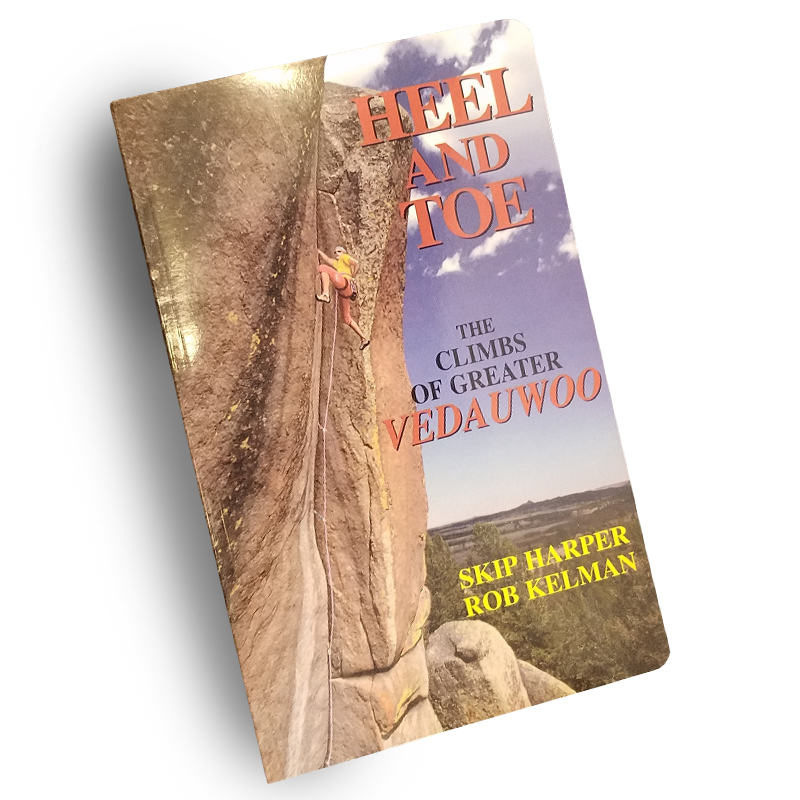 Recognizing this, as well as our combined 28 years of climbing experience at Vedauwoo, Rob Kelman and I dedicated nearly two years (’92-’93) to writing a much more comprehensive guidebook, called ‘Heel and Toe: The Climbs of Greater Vedauwoo Wyoming’. Published in 1994, it was the first ‘digitized’ guidebook of it’s kind and contained detailed information on over 500 climbs. 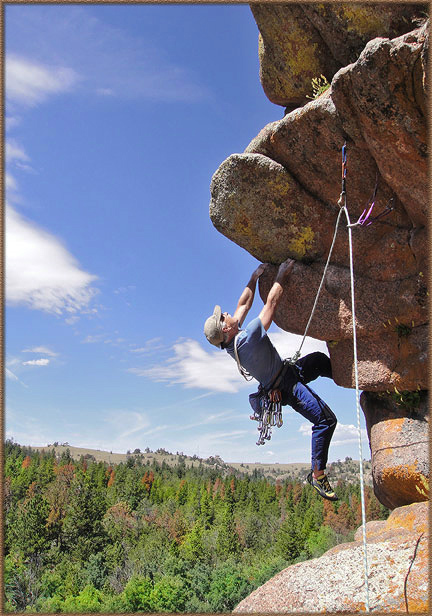 While primarily a climbing guide, it was also an informational resource for all recreational users of the area. 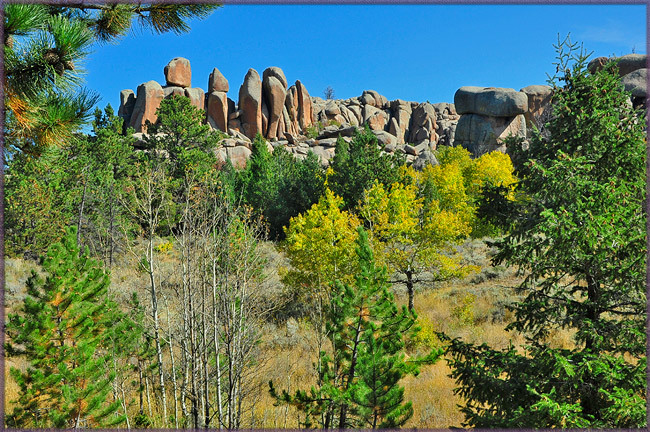 Today, Vedauwoo is under the jurisdiction of the U S National Forest Service and is part of the Medicine Bow – Routt National Forest. It is designated as a semi primitive area and enjoyed by a broad array of recreational users. It remains a place of inherent natural beauty and mystery, seemingly frozen in time, due in large part to its strange rock formations and pleasant, aesthetic valleys. It is very near a principal transcontinental highway, I-80, and consequently, its pristine condition is becoming evermore threatened by the population explosion along the Front Range of the Rocky Mountains. 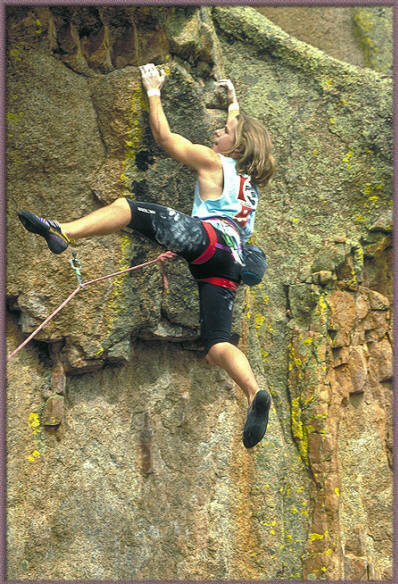 Layne Kopischka was one of the figureheads in the development of Vedauwoo climbing. 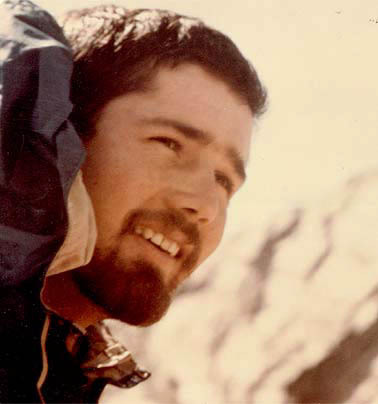 Not only did he write three guidebooks to the area as it ‘grew’ and matured as a climbing destination, but he mentored numerous young climbers and authored many memorable routes. Layne’s unfortunate passing was lamented by all, and there is no doubt his spirit still roams the natural wonderland of Vedauwoo today. Tangible evidence of his profound influences is being discovered even today such as that shown above, an ‘old style’ no. 2.0 Wild Country Friend with his initials clearly stamped into the stem. 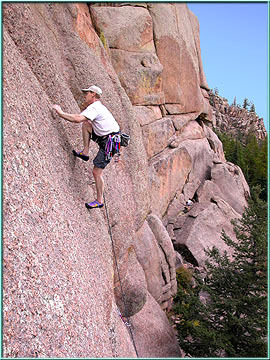 The first recorded climb in the Greater Vedauwoo Area was in 1953, although the University of Wyoming ‘Outing Club’ was active in the area in the late 1940’s. As the ex-members of the US Army’s 10th Mountain Division began attending the University, summiting the formations seemed to become a passion. Registers were placed on top of the formations, usually by the first ascenders and signed by all those who subsequently made the climb. 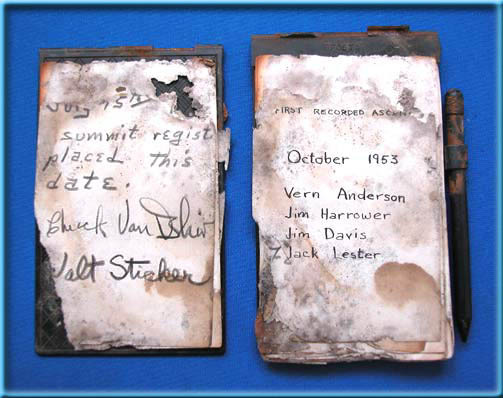 These summit registers form a core component of the history of the area, and the adventurers whose names are found on them built the foundation of all climbing that was to come. 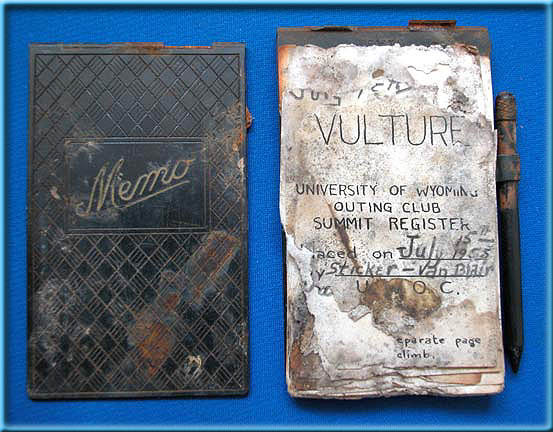 This Summit Register, contained in an old Prince Albert tobacco tin, was found on the south shoulder of “The Vulture”, a huge prominence on the NE end of Blair 2 (*See first photo below for detail of location). As evidenced from the photos, it was originally placed there on July 15, 1955 by Walt Sticker and Chuck Van Blair, the latter being the namesake of the entire Blair area. 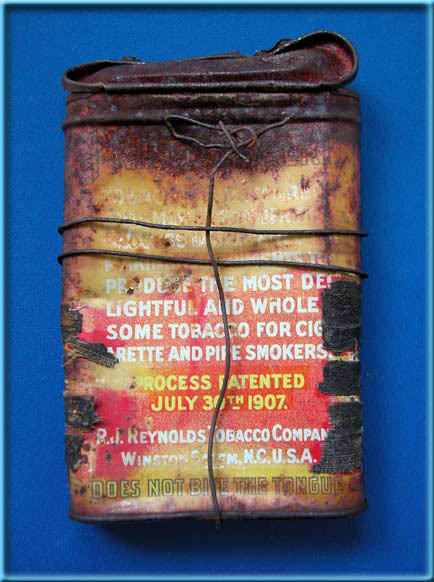 There are many small pages in this register, each of fascinating and historical significance. Here’s where it all started…. 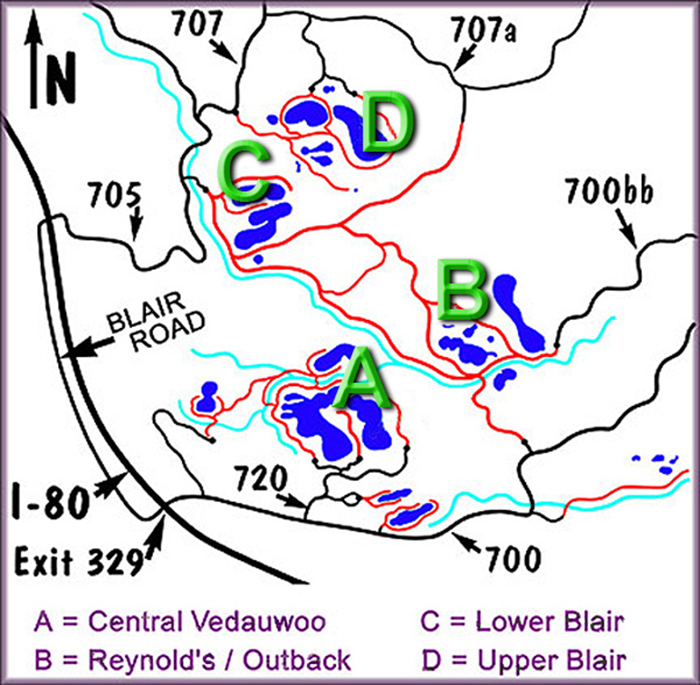 the word ‘vedauwoo’, its etymology and its application to a specific geological location in southeast Wyoming. Also documented in many other places, this book is part of the evidence indicating the origin of this curious word. The book is replete with descriptive text and original photographs of the theatrical production(s) held at ‘Vedauwoo Glen’ between 1928 and 1931. 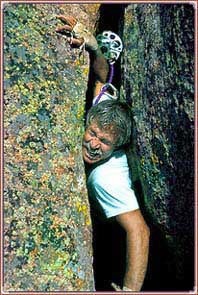 While climbing in the area now known as “Chinatown“, an old, well-used carabiner was found wedged deep inside a crack. It was obvious that it was taped with an identifying color band of plastic tape and some specifications (Carrico Minimo – 1800 Kg) were stamped on it. Also, the initials JFM were clearly stamped on the gate. 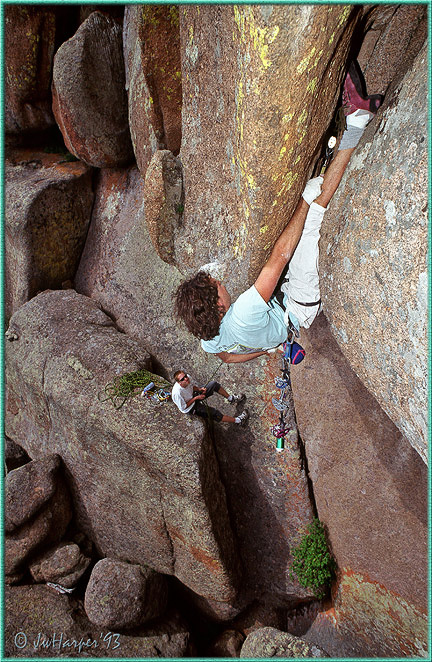 When considering all names of people associated with Vedauwoo having those initials, only one name kept coming up – Jan Mathieson, the Co-Author of the first two guidebooks to rock climbing at Vedauwoo. Attempts were made to contact him to no avail. 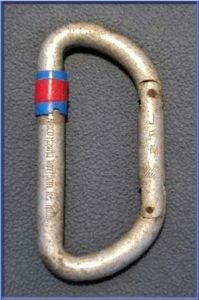 However, according to Jim Halfpenny, the other author of these books, this is the type carabiner used by Jan, the tape colors were used by him to identify his gear, and his initials are JFM. Until we hear differently, we are assuming this belongs to Jan. 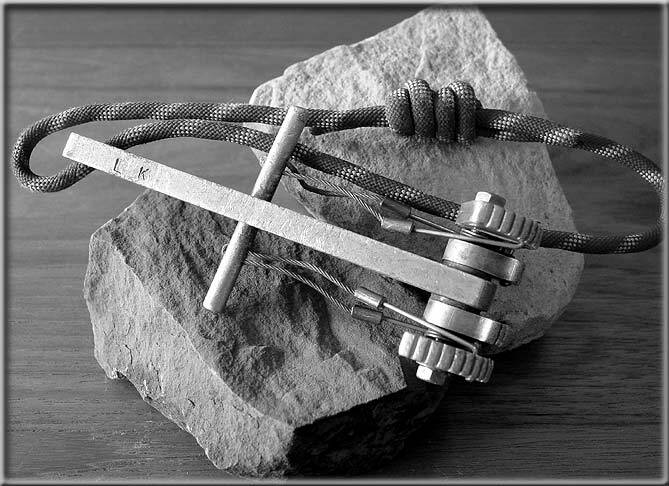 If so, it is well over 30 years old and part of the gear used by one of the original, very productive hardmen responsible for making Vedauwoo the superb climbing destination it is today. The first image below is one of the many promotional posters that propelled the public to come and see it. The second image (and third) was shot right off the screen and reproduced here. 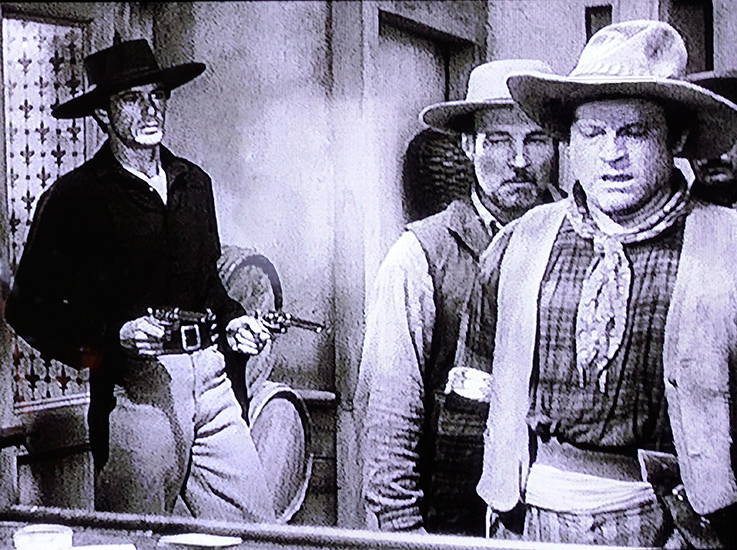 The second shows Wild Bill (Gary Cooper) holding the gang responsible for killing Buffalo Bill at bay until the Calvary could arrive and take custody of them. The third image clearly shows some major rock formations in Vedauwoo, more specifically in Blair including the well-known ‘8 Ball’ (which can actually be seen today from I-80), ‘John’s Tower’ (both NE and N faces), ‘North and Middle Corner’ and part of ‘The Heap’ where the highly sought after climb ‘Spectreman’ can be found. 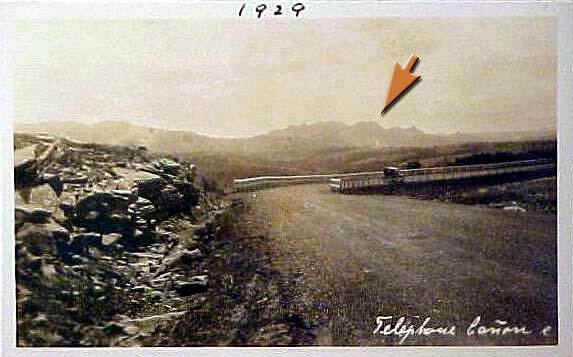 The cavalry is seen dashing by this area, headed supposedly towards Deadwood, South Dakota. 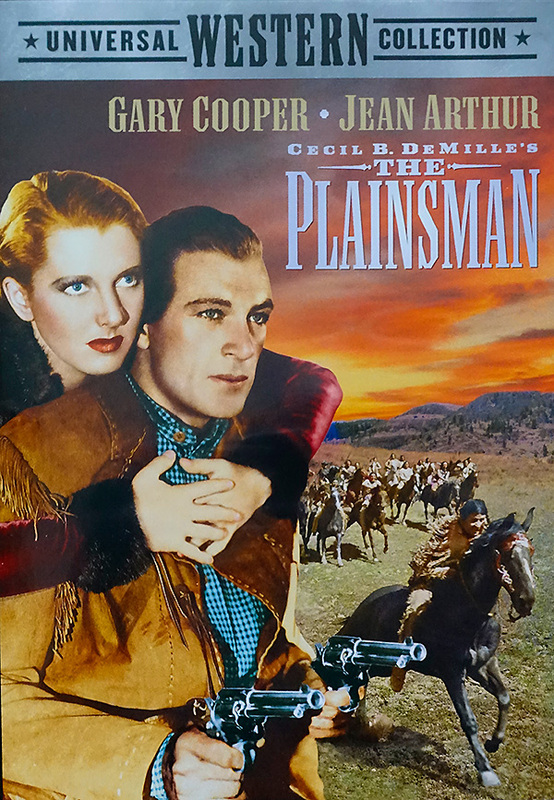 This scenic shot and several others showing Vedauwoo Terrain are sprinkled throughout the movie. Go ahead and take a look….. see it for yourself. While not a part of Vedauwoo specifically, it is very close. The contours of Vedauwoo are clearly seen in the background of both photos above. 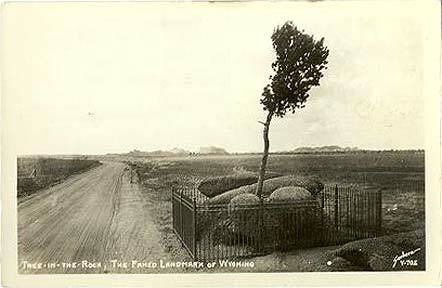 The first, taken in 1927, reads “tree in the rock, famed landmark of Wyoming”. The second was taken 73 years later. This little tree is right on I-80 and seen by nearly everyone who passes by. It seems to grow out of solid rock, Sherman Granite, the same rock that forms the mysterious landforms found throughout Vedauwoo. It was first cited and sketched by Union Pacific Railroad personnel as they laid rails across Sherman Mountain in 1867, and it is said the indians had seen it for at least a century before that. 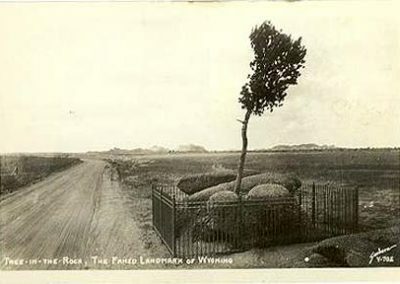 The Lincoln Highway (the first transcontinental highway) was built right past the tree in 1913 and it became a favorite subject of early postcards. Although its age is unknown, limber pines (Pinus Flexilis) like this can live as long as 2,000 years. Today, although twisted and stunted from decades of ceaseless wind and other causes, it continues to survive as a curious historic landmark of Southeastern Wyoming and the Greater Vedauwoo area.